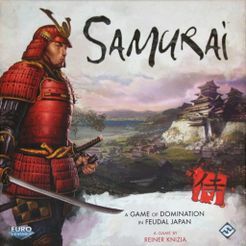 Buy Samurai and PriceWatch, Buy this board game at the Lowest Price. The figures in this game are well designed and add a nice atmosphere to the game. They are hard black figures that represent the three main social classes in feudal Japan (Monk, Aristocrats, and Farmers). There are four sets of influence tokens in each of the player colors. These represent the political and military influence of each Samurai. There are also screen in the players colors to hide the players tokens. There are three boards that fit together like puzzle pieces to make up one larger map of Japan. Interesting but may have limited gameplay. The rule book for this game really made no attempt to tie a story into this game. Nevertheless the theme of the game is based around influencing the social classes of Japan in order to in the end hold the most political power in the country. This is a pretty good theme considering that it is just thrown over an abstract game but it works. The trouble is that somewhere during the development of the game they decided to make the map a fixed map of Japan. I feel that the theme may have limited the gameplay. Smooth and Fast Paced for 2 players. The game doesn't feel as smooth with more. The only other complaint I have about the gameplay is that it is a "hard" map that may have benefited from being random. There is some randomness in the because at the beginning of the game each player will take turns placing the social class markers in the different cities of Japan. Some cities will have one or two class markers while the capitol will have all three. This will make for a different game every time but I think a more random board may have been better. After the board is set up player's will be able to draw 5 of there influence tokens and take turns placing them down. Several if the tokens only influence on type of social class while the military influence tokens influence all types. There are low value influence tiles that will allow a player to play more than 1 influence tile in a turn. As players take turns placing down influence tiles around the social class markers, the class markers will eventually be surrounded. When the marker is surrounded the player with the most influence over a social class takes the appropriate marker. The game ends when all the class markers are cleared off the board. The person who has the most markers in 2 types of social classes is the winner. If I were a Samurai who was disgusted by the decaying social aspect of 1800s Japan, who found myself in a town run by two different gangs would I find that this game aided me while playing a double agent pitting the two gangs against each other only to have my unique situation stolen by Clint Eastwood? Yes this game has that unique feel that will fill a gap in even the most bloated of game collections.